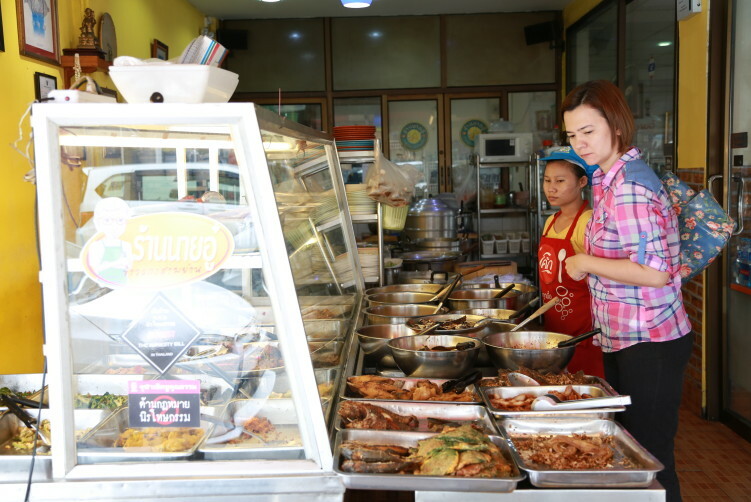 When approaching a rice and curry stall, or khao gaeng in Thai, you better be hungry. The options are normally plentiful and lovely aromas and colorful dishes on display is what meets you. 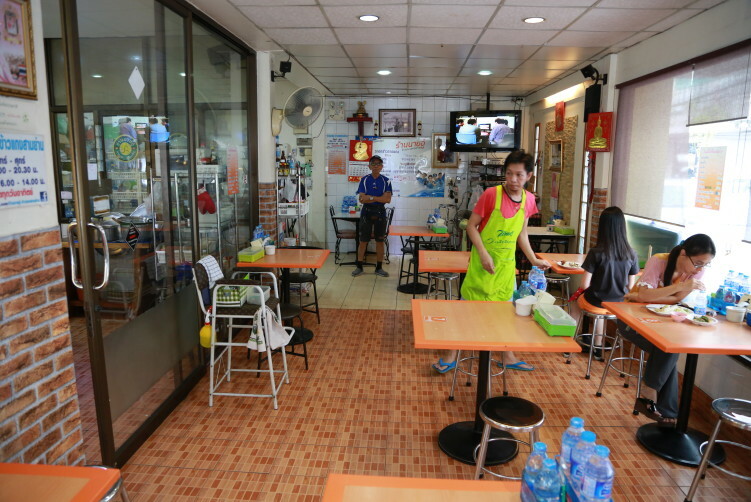 One of the good once are Ran Nai Oo in the Sam Yan area of Pathumwan. It serves delicious food, is clean and safe and won’t give you any stomach problems. You need to have a bit more careful approach for rice and curry vendors than for most other street food vendors as the curries are precooked and just warmed up (not boiling) when you order it. That means the flora of bacterials is a bigger issue than for other type of vendors that prepares the food on spot. But at Ran Nai Oo that’s really not an issue. I have been eating here several times over the years and it has always been good food, clean interior and exterior and they seem to take food safety seriously. You have a pretoria of different dishes to choose from, not only curry dishes, but the curries really are a must taste at Ran Nai Oo. 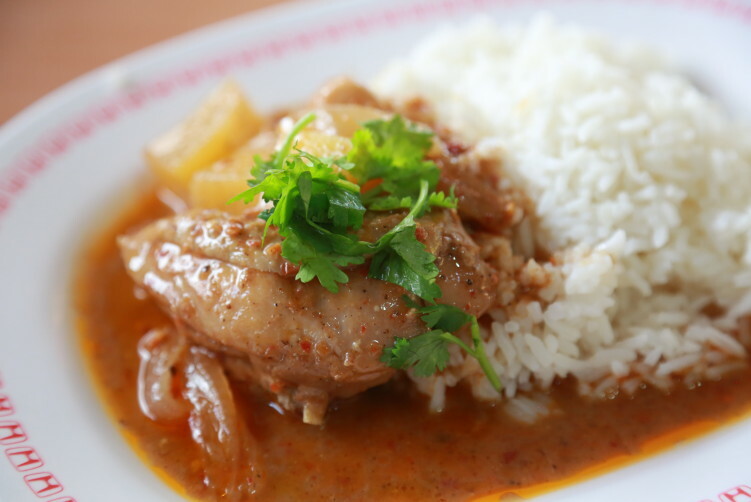 Green chicken curry and panang curry are excellent choices to test out on your first visit. Personally, I’m a big fan of panang curry when the vendor shows skills on finding the fine balance which is necessary here. Most vendors doesn’t do that and use to much sugar, but at Ran Nai Oo they know what they’re doing. 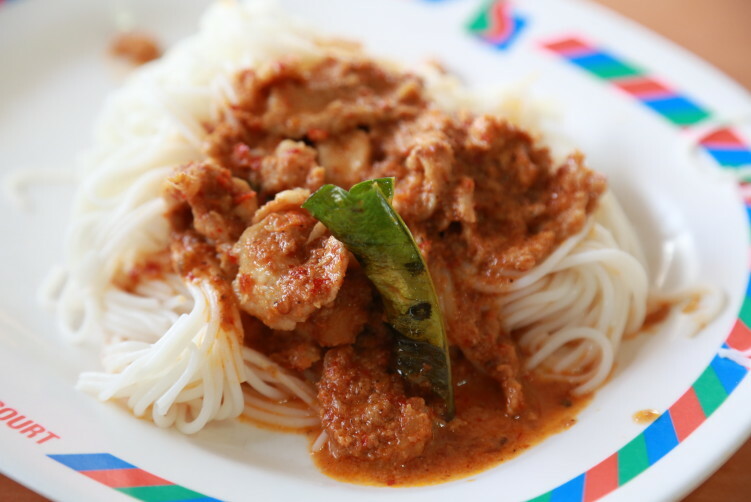 The curry is a rich coconut cream flavored with herbs (paste) and spices, with slices of tender and tasteful pork. When here, I normally order the panang curry, but not with rice as you would expect. I choose their famous and absolutely excellent khanom jeen which is rice vermicelli noodles that is carefully fermented. It’s a complicated flavor to make as it should be both sweet, sour and salty at the same time. Some vendors let the rice ferment for up to three days (sour versions), which is making it difficult to receive a balance in my view, but the noodles at Ran Nai Oo is not fermented that long. After the fermentation, the rice is boiled and made into noodles by extruding the resulting dough through a sieve into boiling water. When done right, as done here, it has a wonderful flavor and texture. You can choose a variety of other curries with the khao jeen as well, as it just replaces the rice. The expression Khanom usually refers to desserts, but it also have a wider sense, meaning food that uses flour as the main ingredient. The word khanom jeen (sometimes written chin) is probably derived from the Mon people (an ethnic group form Burma that settled in Central Thailand) were khohn ohm jin, meaning “twice boiled”(ref Wikipedia). You have a vendor in Banglamphu, Somsong Pochana, that uses khanom jeen in a dessert, mixing the noodles with sweet coconut milk and pinapple sauce. A delicious dessert. Anyway, Ran Nai Oo have been serving curries for more than 50 years. And people come back again and again, due to their delicious food. The green curry, probably their most known dish, seems to be the one that many locals comes for. the fermented noodles with some kind of curry comes second. At Ran Nai Oo you can also go for rad khao, meaning you get a plate of rice and can choose 2 curries on top of the rice, or you can go for gap khao which is full dishes with rice on the side. Gap khao is more food, but also cost more. I also had a couple of dishes, not curries, that was decent. Khao gaeng will probably never go out of style as it’s so entwined with the Thai way of life – meaning it’s fast, it’s cheap and it’s easy to share. The owner has enough vocabulary in English to understand you and respond. He is helpful in recommending to eat. visit website Address: 198 Chula Soi 11, Pathumwan. How to get there: Take the MRT to Sam Yan station, exite towards Chamchurri Square. Cross the Phaya Thai road, and continue until you get to Chula Soi 11. Make a right on Soi 11, and you’ll find the restaurant on your right hand side on the corner of Soi 48 Alley. It’s a 8 – 10 minutes walk from the MRT. Ran Nai Oo in the Sam Yan area of Pathumwan is really good rice and curry stall (khao gaeng). It's clean and safe and won't give you any stomach problems. See full review at StreetsideBangkok.